I saw a picture of these cookies on Pinterest, I think, and thought they look just like the delicious oatmeal raisin cookies at KFC. The think I love about the oatmeal raisin cookies at KFC is that they are really sweet, chewy, and the raisin flavor is confined to the raisins. It's not like the whole cookies is raisin flavored, which is fine in some cookies, but I like this one. Unfortunately, this recipe is not exactly what I was looking for, but I think I kind of knew it wouldn't be when I started out. The recipe doesn't call for as much sugar as a typical cookie recipe, so I thought it might need more sugar. Next time I make these I will probably be adding another quarter cup, and I'll also cut back on the flour, because even the cookies that were underbaked when I pulled them out of the oven turned out fluffy in the middle. And now that I think of it, I didn't follow the instructions as far as the order of mixing the ingredients. I suppose that could be part of my problem here. These cookies taste good. Don't get me wrong; they just aren't quite what I was going for. You know, the elusive cookie recipe that is probably distorted in my memory. I have so many of those. So, these cookies are what I would describe as fluffy, soft, and moderately sweet. Place raisins and water in a small saucepan and bring to a boil. Turn heat down to low and simmer for 15 minutes. Remove from heat and allow to cool completely. In a medium bowl, mix together oatmeal, flour, baking soda, salt, cinnamon, and nutmeg. Set aside. Cream together butter, Crisco, and sugar. Beat in eggs and vanilla. Add dry ingredients and mix until just blended. Mix in raisins and their liquid until raisins are evenly distributed in the dough. Scoop dough into tablespoon sized blobs and place on parchment-lined baking sheets. Bake at 375 degrees for 10 to 12 minutes or until done. Allow cookies to cool on sheet for a couple of minutes and then move them to a wire cookie rack to cool completely. 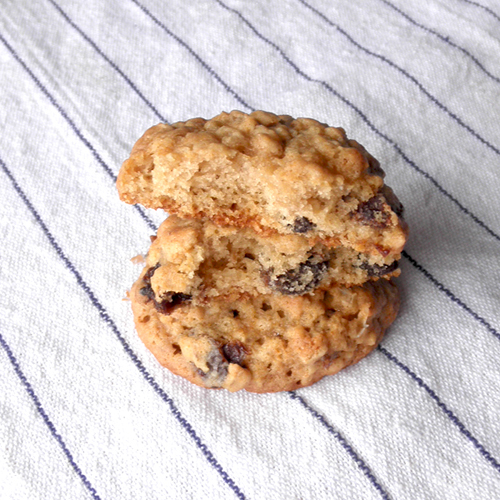 Inside the fluffy oatmeal raisin cookie. 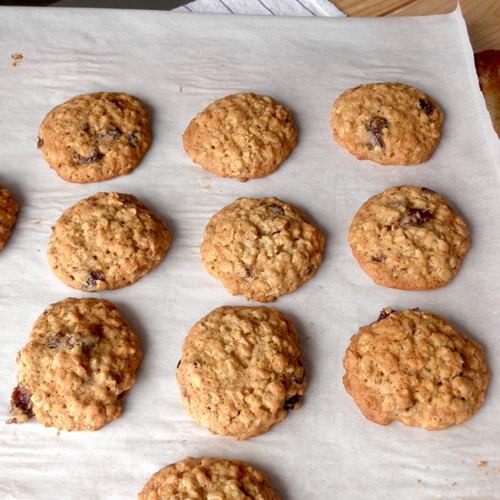 Your oatmeal raisin cookies are a wonderful delight to have after dinner.